To hasten the settlement of "unused" land in the west and to pay the Commonwealth's soldiers for their service in the War for American Independence, the Pennsylvania legislature in 1785 set aside 600,000 acres west of the Allegheny River and north of Butler. The size of each veteran's allotment depended upon his rank during the war. 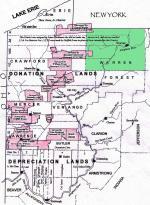 A private, for example, could acquire 200 acres while a major general could receive as much as 2,000 acres. 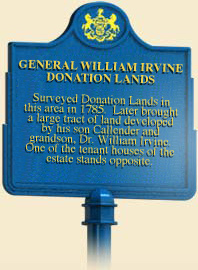 To survey and dispense these "donation" lands, the Commonwealth appointed Brigadier General William Irvine. Competent and knowledgeable about the west, Irvine was a natural selection for the post. He was also a friend of General Washington. Born on November 3, 1741 in Northern Ireland, Irvine received a private secondary education and studied medicine under the famous Dr. Cleghorn of Dublin. He then served in the British Navy as a ship's surgeon during the Seven Years War, during which quarrels with his commanding officer led him to relocate to Carlisle, Pennsylvania, where he established a medical practice in 1764. William Irvine, by James Reid Lambdin, copy after Robert Edge Pine, c.1788. Like most Scottish Ulstermen, Irvine supported American Independence from the outset. In 1775, he raised and then commanded the 7th Pennsylvania Regiment as its colonel. Captured by the British at Three Rivers during the American expedition against Canada, Irvine was released on May 6, 1778. 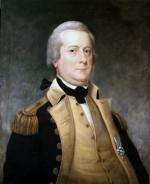 He immediately resumed arms, distinguished himself at the Battle of Monmouth, and a year later was promoted to Brigadier-General in the Continental Army. His brigade, deployed near Trenton, New Jersey, took part in the Lord Sterling Expedition against Staten Island and in General Anthony Wayne's unsuccessful attack at Bull's Ferry. In the fall of 1781, upon Washington's recommendation, the Continental Congress gave him command of the Northwest frontier. Stationed at Fort Pitt, he retained this command until the end of the war. After the war, Irvine served in several political and military posts. In 1785, the state assembly appointed him its agent in charge of identifying western lands for donation to the troops, and rewarded him with a generous land grant in present-day Warren County. In exploring the western lands, Irvine became convinced that Pennsylvania should purchase a tract known as the Erie Triangle, which would give the state frontage on Lake Erie. Irvine then served as a Federalist delegate to the Continental Congress of 1786-88, and a delegate to the Pennsylvania Constitutional Convention of 1790. In 1794, Irvine was Commanding Officer of the Pennsylvania troops sent west to suppress the Whiskey Rebellion. In 1800, he became superintendent of the Military Stores at Philadelphia, in charge of the arsenals, ordinance, and supplies of the Army. Irvine held this office until he died July 29, 1804 in Philadelphia. J. G. Wilson and J. Fiske, ed., ""General William Irvine"" in Appleton's Cyclopedia of American Biography (New York: D. Appleton and Company,), 1887-1889.